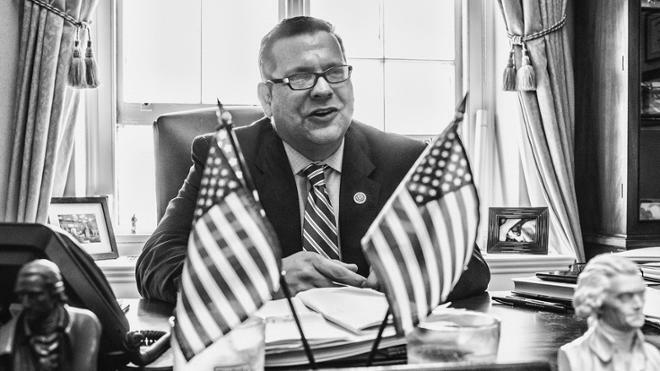 In January, Tom Garrett, ’94 and L’03, was sworn in as one of the 435 Americans serving their districts in the House of Representatives during the 115th Congress. The self-described “conservitarian” talks about debt, protestors, Trump, and how what he learned at Richmond affects his take on the sharp tone of politics today. These are anxious days in Washington, D.C. On a late morning in mid-May, Rep. Thomas A. Garrett Jr. stood outside the southeast corner of the Capitol under a scorching sun, fidgeting with a cigarette in his hands to calm his nerves. Garrett’s day had begun with a closed-door meeting with congressional colleagues, and his afternoon would include rushing to the House floor for a vote. In the meantime, he was still ironing out the details of a press conference scheduled for 2 p.m., where he would promote an issue that was unpopular with his party’s leadership. Throughout the day, visitors both expected and unexpected streamed through his office on the fourth floor of the Cannon House Office Building, hopeful for just a few minutes of his time. When he was there, he offered what he could graciously and with good humor. As he moved around Capitol Hill, a rotating but small cast of legislative and communications aides appeared, disappeared, and reappeared at his side. The one constant presence was his scheduler, Denzel Jones, an Army veteran like Garrett whose main job seemed to be reminding the congressman that he was due to be elsewhere five minutes ago. Garrett knows he needs to quit smoking. The task that made him anxious enough to reach for a cigarette waited for him in one of the offices in the Capitol. It related to his efforts to make a humanitarian trip to the Republic of the Sudan to arrange the release of two political prisoners. He had just come from the Rayburn House Office Building across the street to see about a passport photo, and now he had to go to a health clinic under the Capitol rotunda for a battery of travel immunizations. “Give me just another minute, OK?” he told Jones. I always joke with people that I'm a big-government conservative. Enduring the short-term discomfort of inoculation to avoid catastrophic consequences down the road is an apt if unoriginal metaphor for Garrett’s political philosophy. He is believed to be the 13th Spider to serve in Congress, a line that extends from fellow Republican John Ambler Smith, who was elected in 1872, to Virgil Goode, R’69, who served from 1997 to 2009 (see timeline, below). Garrett arrived in Washington in January as a freshman member representing, like Goode, Virginia’s 5th District. It is vast, bigger than New Jersey. It begins near Manassas, not far from the Maryland border, and runs southwest to Buckingham County, where it widens like the bottom of an hourglass sitting atop the Virginia-North Carolina border. It includes all of 18 counties and parts of three more, as well as the independent cities of Charlottesville and Danville. According to the latest census data, he has more than 735,000 constituents, roughly average for a congressional district. Running in this safely Republican district, Garrett won the 2016 general election by 17 points over his Democratic rival. The real battle was in the primary, where he bested three opponents over three ballots at the nominating convention. He describes himself on his personal Twitter account, @GarrettforVA, as a “constitutional conservitarian,” the latter term a mashup of “conservative” and “libertarian.” He is also a member of the Freedom Caucus, a group of roughly three dozen members who make up the conservative wing of the Republican delegation of the House. Its purpose, as described in its official Twitter bio, is to “support open, accountable & limited govt, the Constitution & the rule of law, and policies that promote the liberty, safety & prosperity of all Americans.” When you read that House leadership is being forced to tack right, particularly on a tax or spending issue, chances are the pressure is coming from the Freedom Caucus. “There is an existential threat to our nation and our sovereignty — that is our debt,” Garrett said earlier in the day as he waited in a hallway of the Rayburn building for his passport photo. “To put it in perspective, there was an article three months ago in the paper that said that the wealthiest eight people in the world control as much wealth as the bottom 50 percent. … If you were to take every penny from the bottom 50 percent and the wealthiest eight and apply it to the United States’ current debt, you could pay off 9 percent. Nine. By way of example, he cited a $600,000 federal grant to add crosswalks and a farmers market in a small town in his congressional district. Garrett said the town’s mayor has told him that while he won’t turn down the money, he thinks it would be better spent to improve the town’s badly aging water and sewer infrastructure. It was an example of the virtues of local decision-making that Garrett used on the campaign trail as he made his successful case to 5th District voters. Such political convictions are the reason Garrett and the Freedom Caucus are the House’s strongest voices advocating the full repeal of the Affordable Care Act, aka Obamacare, and why the caucus has sometimes used the threat of federal government shutdowns and default on debt payments as negotiating tools during budget battles. Its members argue that a leaner federal government is essential to the long-term fiscal health of the nation and the promise of freedom and opportunity, and that’s what voters have sent them to Congress to accomplish. The caucus’s philosophy and tactics have made it a powerful minority block, but also an unpopular one with its many opponents. In June, the conservative-leaning Washington Examiner said the caucus has “a history of picking fights with House leadership,” and in March, CNN ran a headline that read, “Why (Almost) Everyone Hates the Freedom Caucus” for a story about its influence (critics would say intransigence) during the health care debate. During interviews for this article, Garrett invited us to include the number for his chief of staff, which “anyone who wants to call can use to contact our office for any reason,” he said via text. The number is 301-221-2502. You can also follow him on two Twitter accounts: @RepTomGarrett (his official account) and @GarrettforVA (his personal account). On his official House site, tomgarrett.house.gov, he publishes columns, press releases, and other information. The official record of his congressional service — including information about bills he sponsors and cosponsors, his committees, and his remarks on the House floor — is available at congress.gov. Back outside after his shots — “not as bad as I thought,” he declared — Garrett approached a podium on a triangle of pavement on Capitol Hill for his 2 p.m. press conference. By now, the temperature was above 90 degrees, and there was nary a cloud in the sky. The heat radiated from the pavement as he stood in a brown sport coat and pink tie waiting to begin. At his side in a red blazer was Rep. Tulsi Gabbard, a Democrat from Hawaii, the first Hindu elected to Congress, and a military veteran like Garrett. They were soon joined by a mother with her teenage daughter and another mother who had been waiting in the shade of an overhang a few yards away. Garrett and Gabbard were there to promote their bill deregulating marijuana at the federal level. They wanted states to be free to decide their own laws with respect to the plant. This was not a popular stance with the leadership of either of their parties, and it was drawing more Democratic than Republican support. But, just as importantly, he was moved by the stories of families like the ones with him at the press conference. The mother-daughter pair was Lisa and Haley Smith. As Haley sat in her wheelchair under a purple shade, her mother described the impact that a hemp-derived oil has made in reducing the frequency and severity of Haley’s seizures and other symptoms of Dravet syndrome, a rare form of epilepsy. Yet, every time Lisa Smith buys the oil that helps her daughter, she risks federal prosecution. Garrett confessed that “the first time I heard the term ‘medical marijuana,’ I probably laughed,” he said, but through interactions with families like the Smiths, he came around to the view that the plant offers medical benefits. The law he and Gabbard sponsor would remove marijuana from the list of drugs prosecuted under the Controlled Substances Act and eliminate federal penalties for growing, distributing, or possessing it. It is nearly identical to a bill promoted by Sen. Bernie Sanders of Vermont in 2015. Despite the bill’s bipartisan sponsorship and what Garrett believes is sufficient if quiet rank-and-file support, the bill faces a number of hurdles before becoming law. It has to survive hearings and votes in congressional subcommittees. Then it has to make it through full committees. And then the entire House must take it up. So must the Senate. And then the president must sign it. That’s the process they teach in high school civics textbooks. What close observers of the legislative process know is that through strategic inaction, a few well-placed individuals have the ability to override even majority views of the people’s house. The chair of any committee or subcommittee can bury a bill by declining to schedule a hearing on it. Once through committees, leadership can still refuse to schedule it for a vote on the full floor. Both parties do it. Sophomore year nearly sunk Garrett’s collegiate career at the University of Richmond. Louisa County High School, where he attended, didn’t send high numbers of students to colleges like Richmond back then, he said, so he arrived on campus worried he might not be adequately prepared. In his first year, he buckled down and earned such high marks that he found himself moving into an honors dorm the following August. Two semesters, skipped classes, and a girlfriend later, he was faced with a 1.4 sophomore grade-point average and the prospect of losing his ROTC scholarship. He pulled it back together and graduated with a respectable GPA he recalls as around 3.0. He majored in history for the same reason he now serves in Congress. In his frequent visits to high schools, he often talks about two heroes of his who, in earlier times, would have been his constituents: Patrick Henry and Barbara Johns. More than Henry’s famous “Give me liberty or give me death” cry, Garrett admires his follow-up line: “If this be treason, make the most of it.” For Garrett, it affirmed Henry’s commitment to stand for freedom and equal opportunity against an unelected monarch even at the risk of his life. The last piece of legislation Garrett filed in the Virginia Senate, where he served from 2012 to 2017, was to make April 23 Barbara Johns Day in Virginia. On April 23, 1951, Johns organized a student walkout at her all-black high school in Farmville, a town in Garrett’s district, to protest the unequal treatment of black and white schoolchildren. Her protest led to one of the five cases consolidated into Brown v. Board of Education, in which the Supreme Court invalidated laws that segregated schools on the basis of race. He introduced a similar bill in Congress honoring her nationally in April. “The difference between Barbara Johns and Patrick Henry is that she was a 16-year-old student and he was a 37-year-old lawyer trained to argue,” he said. What they share is a focus that Garrett said Americans of all political persuasions could use more of. They each prevailed in a contest of ideas over how best to advance American ideals of freedom and equality through determined persuasion, not through a display of force or power. What alarms Garrett as much as our national debt is the tone of current politics, a point he made in May at the beginning of a town hall meeting in Moneta, Virginia, a tiny, unincorporated community in Bedford County. He told the audience that a high school student had recently asked him what he thought of “protestors who break stuff and burn things.” The lawyer in him used his answer as an opportunity to define and distinguish. Garrett’s father, Thomas A. Sr., is Richmond class of 1966. His family’s Spiders also include uncle Frank Garrett, B’61, and sister Paige Garrett Delbridge, W’91, plus “multiple cousins and great-uncles and aunts,” he said. He's a huge athletics fan, too. The town hall got feisty as it got rolling. “Constituents shouted, interrupted, and jeered” and sheriffs “forcibly ejected” one person at the request of the host venue, The Roanoke Times reported. Still, Garrett stayed for two hours to explain his positions and hear out his often angry constituents. When Garrett said “sometimes, living in a democracy means hearing things you don’t like,” the sentiment cut both ways for speaker and audience alike. 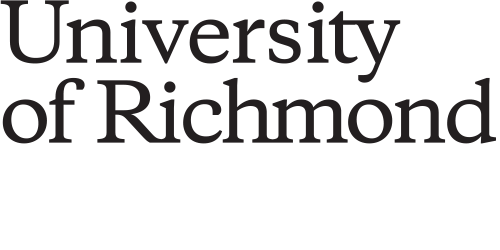 Respect of, and even welcome for, disagreement is among the lessons he took from his years at Richmond, he said, particularly from one of his history professors, Joan Bak, who retired in 2009 after a career studying Latin American labor history. He experienced a similar free exchange of ideas as an adult through his wife, Flanna, an independent musician who lived and performed in the Czech Republic for a decade after college. “I went to visit some of her friends from when she lived abroad, and we sat at a long table with 15 people,” he said. It was an intellectually diverse group that ranged from “three or four at most” who he guessed would have voted as he did in the 2016 election to “out-and-out, proud, self-avowed Marxists,” as he described them. “It was fun, genuinely fun, to sit with a bunch of people who didn’t agree with me from five different countries at the table over a cold beverage and discuss why we thought we were right and they were wrong,” he said. More than anywhere else, the lesson was driven home to him in the Army, where he served for the six years between undergraduate and his enrollment at Richmond Law, with posts in Germany and Bosnia, rising to the rank of captain. In the army, you don’t pick who you associate with, he said. The Army creates the teams, and success or failure is defined by the team’s ability to meet its goals. “You learn that everybody has strengths and weaknesses,” he said. “You learn that you need to figure out how to work with even people who sometimes don’t agree with you on things. You learn that nobody has a monopoly on good ideas. That’s a wonderful challenge. Military service offered the lesson in other ways, too. Despite the American Civil War and disturbances over civil rights, labor rights, and other issues, our national experience with domestic political violence has more ebbed than flowed. Still, Garrett’s early experiences as a congressional representative have offered him moments for concern. In the spring, the Capitol Police investigated death threats against him and his family that came during health care debates in the House. Such threats are increasing against representatives on both sides of the aisle. The June 14 shooting of Rep. Steve Scalise at a Virginia baseball field further raised alarm bells. And then came Charlottesville. Hyperbolic political rhetoric contributes to the corrosiveness, he said. In the health care debate, for example, he takes umbrage that accusations like, as he puts it, “Republicans want you to die quickly because they only care about the rich,” supplant debate about policy alternatives and the proper role of government. The ability to disagree with respect and civility has historically been part of America’s strength, he said. This concern for the tone of the national discourse extends to his views about criticisms of President Trump. “I think Donald Trump gets beaten about the head and shoulders to a degree and by an order of magnitude greater than any president of my lifetime, although to be fair a lot of people took a lot of cheap shots at Presidents Bush and President Obama,” he said. “Having said that, I’m not a sycophant. I think he’s been wrong on things.” Garrett described as “absolutely indefensible” a widely reported tweet by Trump in June that disparaged MSNBC host Mika Brzezinski, for example. “That’s not only beneath the presidency; that’s beneath adult human behavior,” he said. “So I find myself in an interesting spot. Here’s a guy who I think is right on a lot of things, who I think messages in a manner that’s inappropriate at best, on occasion, but I also think he’s subject to a level of hyperbolic rhetoric that is dangerous, candidly. “While I am not married to Trump and certainly don’t think he is a candidate for canonization, I’ll stick up for the fact that the tone has gotten so bad that what used to be disagreement on economic theory has now devolved into who wants to kill whom, and that’s antithetical to what we’re supposed to be as a nation,” he said. The broader impact that our current Spider in Congress ultimately makes on his district and the nation remains to be seen as events continue to unfold and votes come and go. He hasn’t yet been able to make that humanitarian trip to Sudan, where he is working to play a key role in freeing several members of a Christian minority convicted of illegally aiding fellow Christians by giving them food and other humanitarian assistance. But, he said, his service on the House’s Foreign Affairs Committee offers him a look at how politics can be better. He carries with him a conviction that every congressional representative needs: that his or her district is the nation’s finest. He has, however, a better argument than most to back it up, one he shared at the town hall in Moneta. “The 5th District in Virginia was first represented in the House of Representatives by the father of the Constitution, James Madison,” he said. “The father of the Declaration of Independence lived here. The father of the modern Supreme Court, John Marshall, retired here. Patrick Henry retired here. James Monroe ran to represent the 5th and lost and ultimately became a senator and president of the United States. The American Civil War ended here, and the civil rights movement in Virginia began here, so understand this: I know that if I’m about the 10th-best political figure from the 5th District, I’ve done my job well. Matthew Dewald is the magazine's editor.